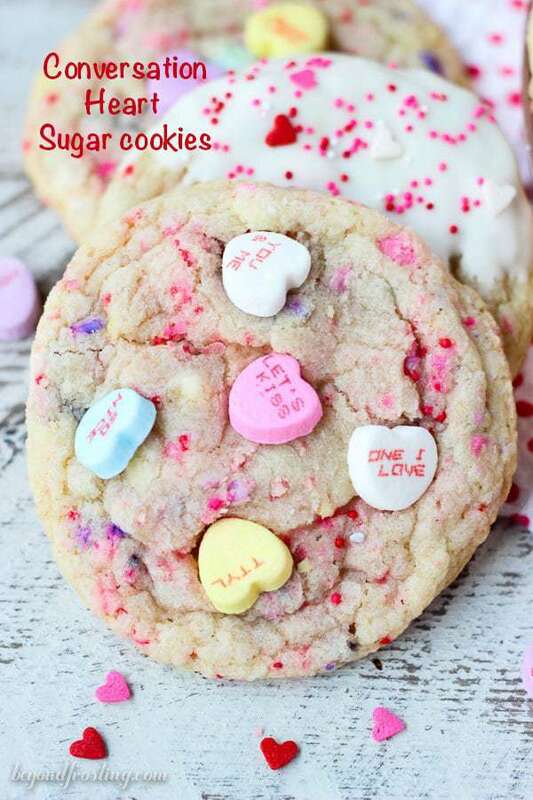 Tell someone you love them with these Conversation Heart Sugar Cookies. 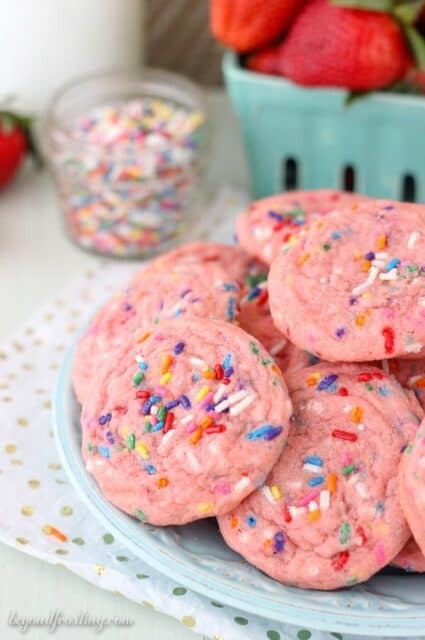 These buttery sugar cookies are filled with little pops of sweetness with crushed candy conversation hearts and sprinkles. What is your favorite way to show someone you care? I love to surprise someone with something unexpected whether it’s a box of treats or a silly gift that makes them laugh, but either way I try to put a lot of thought into what I am sending. So when Valentine’s day rolls around, I get particularly sappy and try to find the best cards to give. Valentine’s day happens to be the same week we celebrate a birthday in my household so I have to make it extra special! You know what’s special? These Conversation Heart Sugar Cookies. 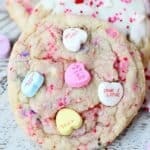 I have to tell you that I am not a huge fan of conversation hearts on their own, but when you add them to these cookies it’s just perfect. I have had these cookies in my mind for quite some time now, because I just love some of the saying they are writing on the conversation hearts these days. Yeah, I am the one shopping for Valentine’s day candy at Target 2 days after Christmas and I’ve been eating Cadbury Mini Eggs for at least a month now. 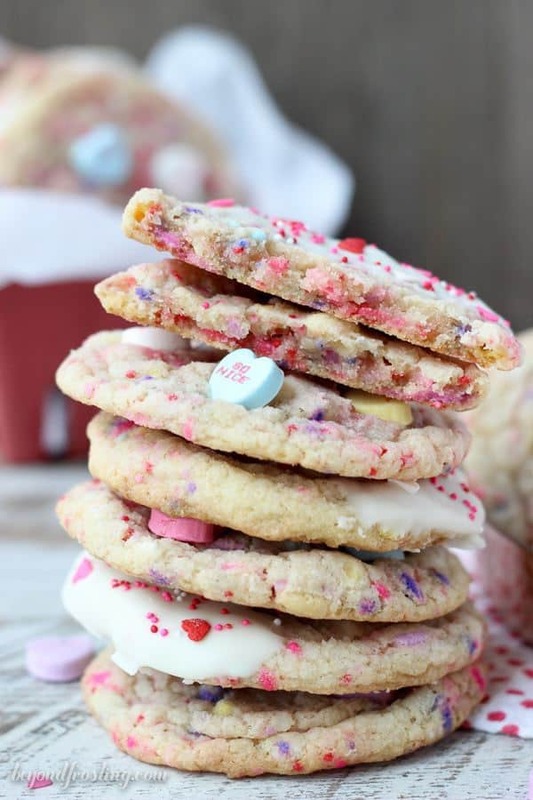 When you crush the conversation hearts and mix them into the dough (with a little bit of sprinkles of course) they make these cookies extra colorful! They are also a tad on the sweet side because of the added sugar. I had to use a food processor to crush the hearts because they were too hard for me to use a rolling pin, and I found the pieces weren’t getting small enough. I didn’t want my friends biting into these cookies and hurting a tooth! I decided to place a few of the conversation hearts on the top of the cookies while they were still warm. Literally right when they came out of the oven and they were still soft and gooey. 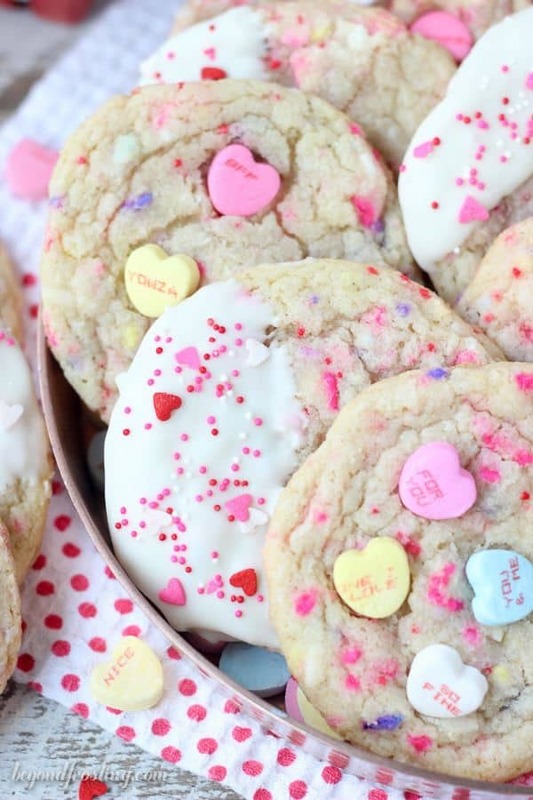 Now if you don’t want to put the hearts on top of the cookies, you might consider dipping them in white chocolate. I did about half and half on my batch. 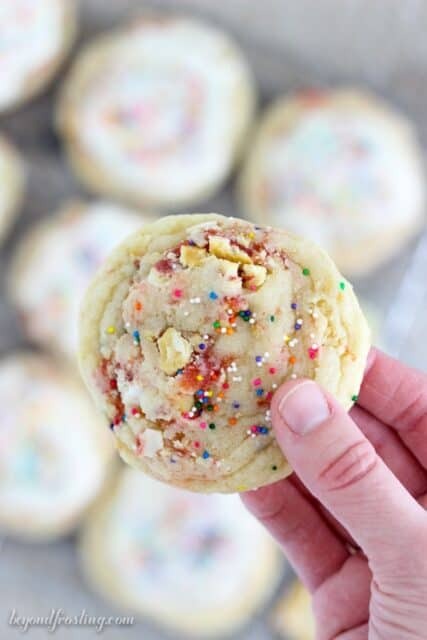 I mean they are already pretty enough, but I think the white chocolate helps balance out some of the sweetness in the actual cookie. I like to use a white chocolate that is made for candy making like Ghirardelli Melting Wafers or almond bark. Both melt down nicely and harden quickly. 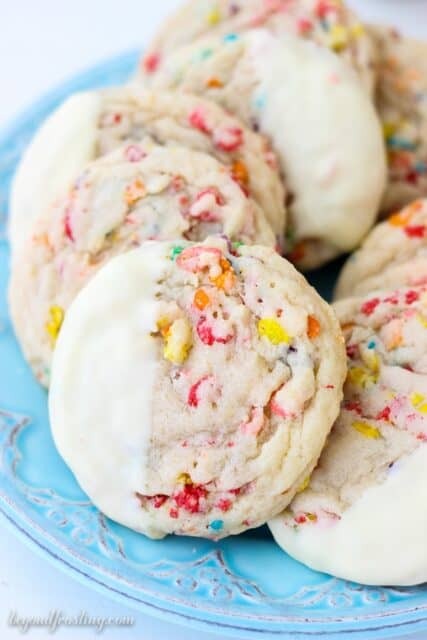 These cookies do freeze very well, so I almost always have frozen cookies on hand. 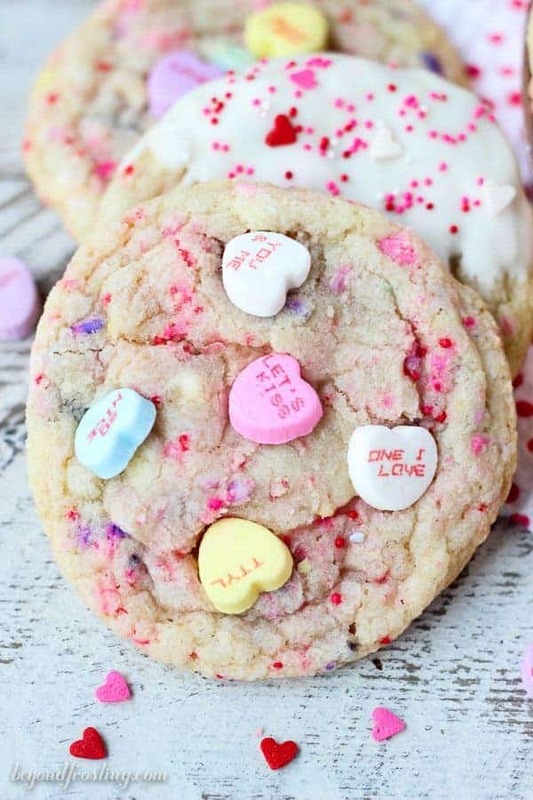 This master soft and chewy cookie dough is also versatile, so if conversation hearts aren’t your thing, maybe try some Valentine’s day Soft N Chewy MnM cookies or even some Strawberry Pop Tart Cookies. 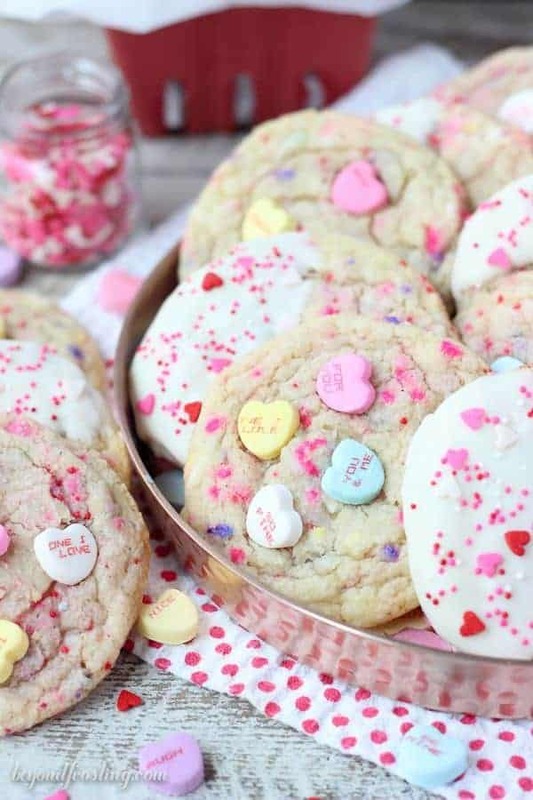 Crush the conversation heart cookies in a food processor until they are crumbly. In a separate bowl, combine flour, baking soda and cream of tartar. Slowly add into batter and beat on medium low speed until well combined and dough forms. As the dough is thickening, add in the crushed conversation heart until they are well mixed. Preheat oven to 350° F. Use a large cookie scoop (3 tbsp) and scoop cookie dough onto a parchment paper lined baking sheet. Place about 2 inches apart. Bake at 350° F 10-12 minutes. Optional, right when the cookies come out of the oven, place a couple of conversation hearts directly into the warm cookies. To coat with white chocolate, break the chocolate up into smaller pieces and microwave it at 50% power for 30 seconds at a time. Stir the chocolate after each 30 seconds so that it doesn’t burn. Then dip your cooled cookie in the chocolate and tap off the excess chocolate on the side of the bowl. Garnish with sprinkles. Set these on a piece of parchment paper to cool.